Seoul Selection is a Korean publishing house that takes a leading role in the globalization of Korean culture, including the arts, society, and lifestyle. 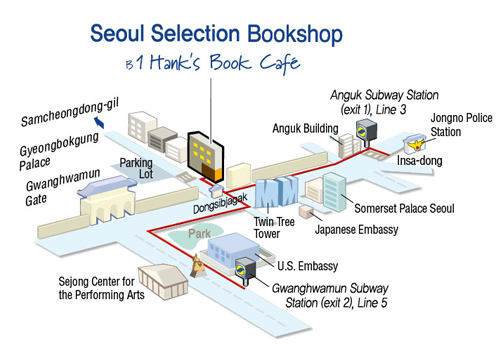 Its distribution network includes major Korean bookstores, university libraries, bookstores in the United States and other foreign countries, and several major online stores, making Seoul Selection titles easy to find abroad. Though located between much larger China and Japan, Korea boasts a huge repository of sophisticated and original indigenous culture, much of which remains to be translated and made accessible to non-Korean speakers. Seoul Selection seeks to boost the world’s understanding of Korea through the publication of works on a wide and diverse range of Korean topics, including history, culture, tourism, economics, society, education, and more. In an age of information overload and mass marketing, Seoul Selection aims to play the role of a dependable guide, selecting and providing easy access to high-quality samples of Korean culture to those looking for a taste of this fascinating country. Seoul Selection means “Select Korean Goods Available in Seoul.” In this age of information overload and mass marketing, we want to play the part of a dependable guide. We aim to help those looking for a taste of Korean culture to easily find quality samples. Whereas “collection” often refers to an exclusive assemblage of art or coveted items, “selection” lets one choose. In that sense, we give our customers access to affordable and appealing cultural works worthy of their attention. That is our basic philosophy.